Pokhara is the Queenstown (New Zealand) of Nepal. Of course there are differences– the air is much more polluted here, but people also do other things besides cater to tourists. The city opens out onto a lake and offers lots of high adventure tours, coffee shops, and bars. 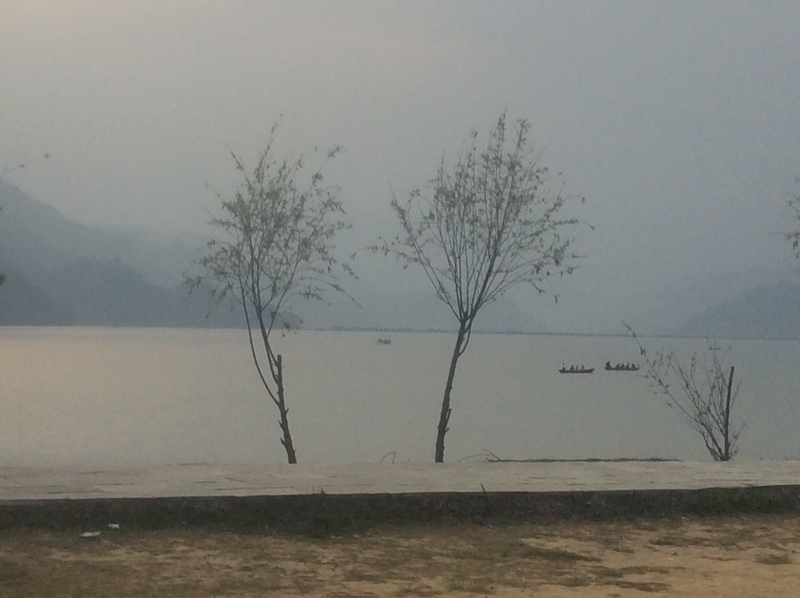 This morning over breakfast I watched dozens of paragliders taking off from the mountain above, slowly circling to the lake, which was soon covered with kayakers and people paddling around on the Nepali version of party barges. The skies were also populated by ravens which seem to run off most other birds. Large purple-black heads and black beaks, confident and mouthy. From the rooftop restaurant of my hotel, I could look down on the strange configuration of the lakefront itself. There must be some odd property laws as there is a band of undeveloped land between the main road and the water itself. Within that band are tumble-down houses, small gardens, and even some cattle grazing. Then right at the water’s edge are ramshackle bars and restaurants that seem more or less temporary. It makes for a good vibe as the waterfront seems to belong to everyone instead of being dominated by real estate developers–a good town. Still, after finishing a trek, getting clean, and joining the rest of the people, it is hard to recapture the total body hum that is walking in the wild. There is an insouciance that comes from the privilege accorded a “paying customer” which is something never felt by the long-distance hiker–an undeserved privilege. I wish I could say I spent the day thinking and writing, but much of my time was dealing with recalcitrant and poorly designed web pages for annual reports and training back at Georgia Tech. Whoever made up the web content must have thought everyone had the bandwidth of a firehose, were not in a place where the electricity is off more than it is on, and where the routers work at dialup speeds. Such is the technological chauvinism of the west.